9th Row - ch3, 1dc in the next 17dc, 5dc in next dc, 1dc in next 27dc, 5dc in next dc, 1dc in the next 38dc, 5dc in next dc, 1dc in the next 27dc, 5dc in the next dc, 1dc in the next 17dc, 1dc in top of ch3. Turn. (147dc + ch3). 10th Row - (Divide for armholes) - ch3, 1dc in each dc to corner, 2dc in centre dc of 5dc on corner, skip 31dc, 2dc in centre dc of 5dc on next corner, 1dc in each dc to next corner, 2dc in centre dc of 5dc on corner, skip 31dc, 2dc in centre dc of 5dc on next corner, 1dc in each dc to end, 1dc in top of ch3, ch1, sl st to top of ch3 on beginning of row. Turn. (90st + ch3). Next Row - ch1, (1sc, 1hdc, 1dc) in next sc, * skip 1dc and 1hdc, (1sc, 1hdc, 1dc) in next sc, * rpt from * to * to end, sl st to first sc. Turn. Pattern Row - ch1, (1sc, 1hdc, 1dc) in base of ch1, * skip 1dc and 1hdc, (1sc, 1hdc, 1dc) in next sc, * rpt from * to * to end, sl st to first sc. Turn. Rpt Pattern Row once. Fasten off. Rib - ch3, 1dc in each dc to end, sl st to top of ch3 on beginning of row. Turn. Next Row - ch3, * 1dcf in next dc, 1dcb in next dc, * rpt from * to * to end, sl st to top of ch3 on beginning of row. Turn. Rpt last row twice. Fasten off. Next Row - ch3, 1dc in each dc to end, sl st to top of ch3 on beginning of row. Turn. Rpt last row 6 more times until 8 rows have been worked in all from yoke or underarm sleeve seam measures approx 3.5 inches. Turn. Fasten off. With 5.00mm hook and contrast color 2, ch1, (1sc, 1hdc, 1dc) in base of ch1, * skip 2dc, (1sc, hdc, 1dc) in next dc, * rpt from * to * to last 2dc, (1sc, 1hdc, 1dc) in next dc, skip last dc, sl st to first sc. Turn. Next Row - ch3, * 1dcf in next dc, 1dcb in next dc, * rpt from * to * to end, sl st to top of ch3 on beginning of row. Turn. Rpt last row once. Fasten off. Starting with ch3 work * 1dcf in next dc, 1dcb in next dc, * rpt from * to * to end, 1dc in top of ch3. Fasten off. Next Row - ch3, work 1dc in each dc to end, 1dc in top of ch3. Turn. Next Row - ch1, (1sc, 1hdc, 1dc) in base of ch1, * skip 1dc and 1hdc, (1sc, 1hdc, 1dc) in next sc, * rpt from * to * to last dc, hdc and sc, skip dc and hdc, 1sc in sc. Turn. Rpt last row once. Fasten off. Rib - ch3, 1dc in each dc to end, 1dc in top of ch3. Turn. Next Row - ch3, * 1dcf in next dc, 1dcb in next dc, * rpt from * to * to end, 1dc in top of ch3. Rpt last row once. Turn. Fasten off. Finishing - Over sew or slip stitch cast on edge together, work 60sc evenly along neck edge. Attach Hood to Sweater - Slip stitch or over sew through cast on ch on yoke of sweater and front loop of sc along neck edge on hood. Fasten off. Sew in and tie off all loose ends of yarn, sew toggle buttons evenly down button band and fasten through dc's. 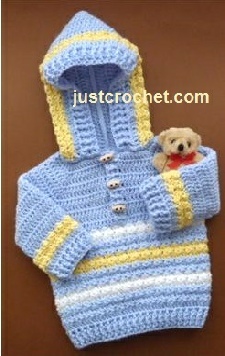 Hope you enjoy this free crochet pattern for a hoodie with toggle buttons.